We're in the middle of summer and it's hot. Working outside can be difficult and a challenge to stay cool in projects that require clear thinking and constant troubleshooting. It's easy to try for shortcuts to finish faster. Sometimes, unaware of being lazy, you can get yourself in trouble and make choices that lead to more not less work. 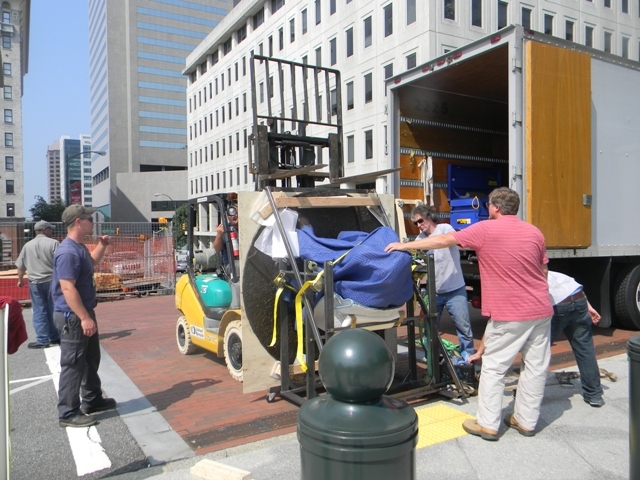 Moving Art is always problematic, when it's 100 degrees outside it can be a problem. 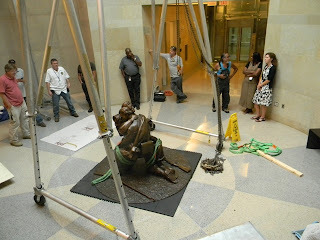 A couple of weeks ago I was asked to be involved in moving and installing a 1000 lb.bronze sculpture for the Capitol of Virginia's new Visitor's Center in Richmond, Va. I had heard about the project from 2 separate companies and finally was contacted directly by the staff at the Capitol. Apparently, they hoped the installation could be completed asap and because of it's difficulty there was a lot of uncertainty. 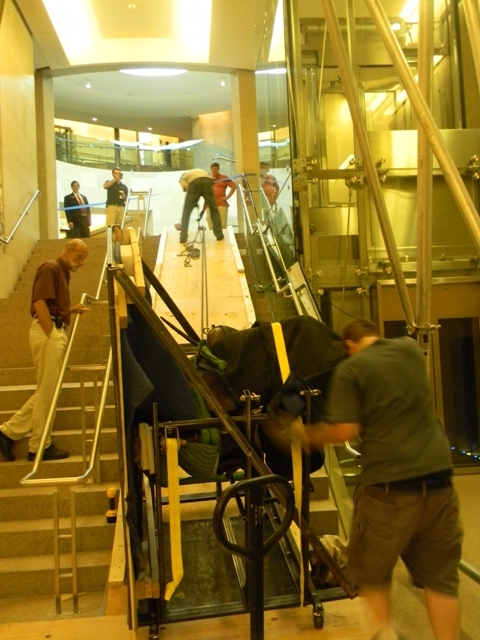 The sculpture was too big for the elevator and where it was to be installed there was 32' of steps. From the bottom of the staircase, to the top step, it looked like we had to climb a small pyramid. There was a flurry of emails as the project scope began to develop. 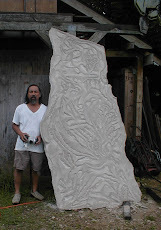 Finally, they asked if I would work with Artex, Inc. as this would simplify the contracting process. The Capitol was very familiar with both of us. 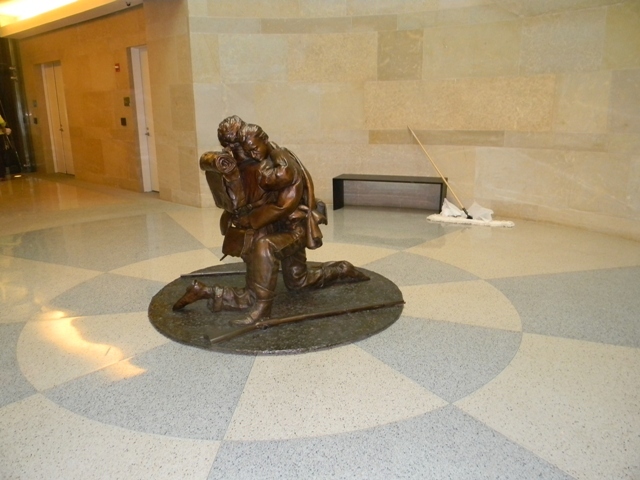 I had previously worked for Artex and acted as the on-site project manager responsible for the safe handling/ packing/ and transporting of all the Art when the Capitol was renovated a few years ago and then again, responsible for the installation of the Art when the restoration was completed. That project was about the best thing I have done professionally. For a stone sculptor, handling the Jean-Antoine Houdon's marble sculpture: the full size George Washington and the bust of Lafayette was a revelation. 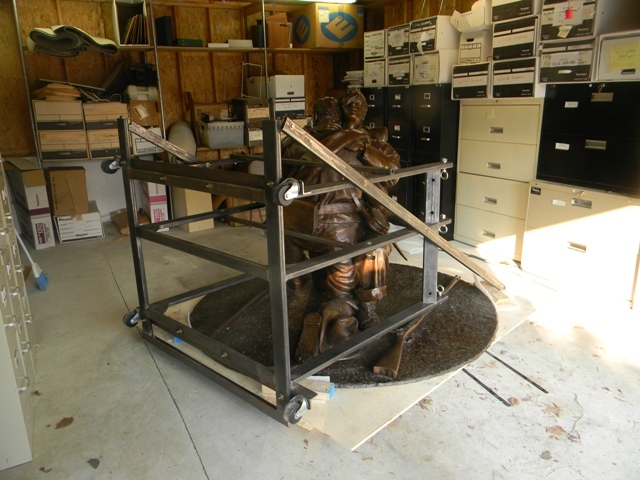 The bronze sculpture was to be picked up in Fredericksburg, Va. first. Already at 8 am it was 90 degrees and humid. It was packed in a steel handling frame for transport. Discussing the project with the owner and the crew the difficulties ahead started to get clearer. The size of the sculpture base @ 72" diameter required us to flip it 90 degrees in order to pass through obstacles, doors and hallways. A forklift would be provided in Richmond to rig it to the door and then we would be on our own. Already dripping from the heat, I started to sweat about the work. As we were leaving, the owner of the sculpture took me aside and said he was most worried about the steps. How were we going to overcome that problem. I told him we were prepared but that I wasn't ready to answer him. He asked how long did I think it would take? " One day," I replied. He smiled and said he and a associate had bet it couldn't be done. I smiled and said I'll take that bet. " How about a coffee at Starbucks?" 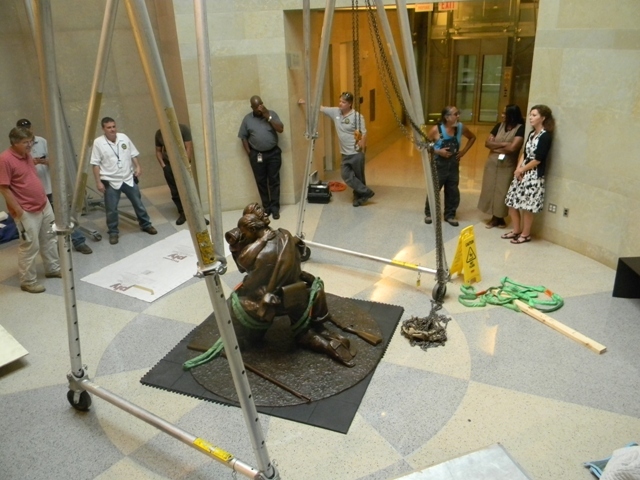 Labels: art, art and art handling, bronze sculpture install, Capitol of Va.